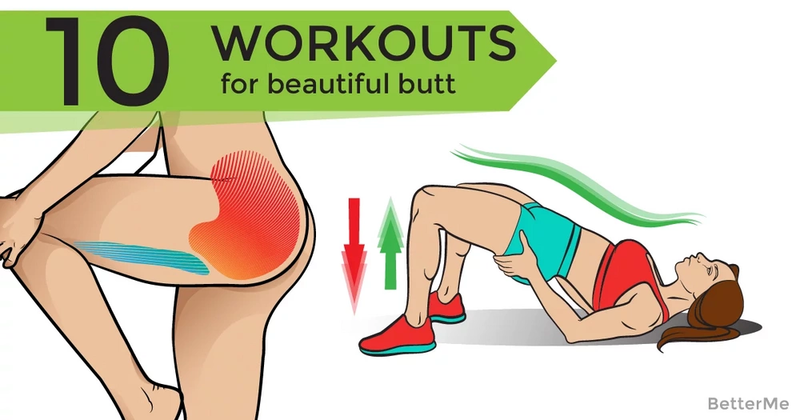 The difference between buns of steel and buns of, well, pants are these 10 bum-blasting exercises. We tried them and now it's your turn. Get moving! Alternate tapping feet for 1 minute. Starting on your hands and knees, keeping your core tight and back flat. Raise 1 leg and keeping knee at 90 degrees. Push that leg as high as you can in the air and lower back down. Repeat for 12 reps, then switch legs. Feet stance is wider than hip width. Keep your back straight and arms locked with the dumbbell in the middle. Aim for 10 to 12 reps.
Continue these explosive lunges, alternating sides, for 1 minute. Walk from one spot to the next by raising each knee high towards your chest, on your toes at the top with the grounded leg and then come down and repeat the other side. Stand with your feet slightly wider than shoulder-width apart and lace your fingers behind your head. Keeping your elbows back, bend into a squat position – the wider squat the easier it is to get into a low squat with a straight back. Press back up to the starting position and repeat. Stand with your knees slightly bent and hold a medicine ball with both hands. Fully extend your arms straight out in front of your body at shoulder level and perform a full squat. Repeat and complete as many as you can. Grab desired dumbbell weight and stand with your feet slightly wider than your hips, toes pointed outwards. Lower your hips down to the ground so you are essentially hovering. Holding the weight with both hands, press and rest your elbows on the inside of your knees. Keep your feet planted on the ground and lift towards the ceiling, leading with your glutes . Keep your back straight. Stop when you are parallel to the ground. Return back down to the starting position and repeat for instructed reps. Begin in a lowered squat position with you feet shoulder-width apart. Explosively jump up and land back in the squat position. Careful to maintain good form and prevent your knees from extending beyond your toes in the squat or landing position.